Did You Know: We offer a Jet Ski Adventure Tour that provides the BEST Jet Ski experience in Panama City Beach. Our Jet Ski Rentals are NOT guided. This means you have the freedom to explore the waters of Panama City Beach. Renting a Jet Ski is a popular attraction in Panama City Beach and it is very easy and safe to do. You’ll see why when you are blasting across the beautiful emerald green waters on your trip to Shell Island. 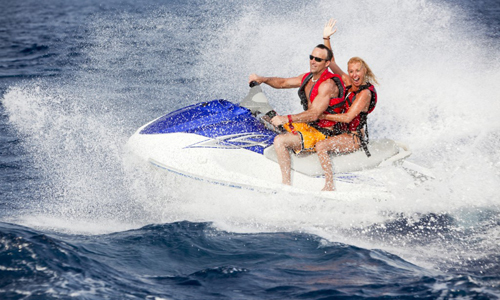 Your Jet Ski Rental: Our Jet Skis are well-maintained Yamaha models and will do up to 55MPH. These waverunners provide a stable, solid ride and hold up to 3 passengers or up to 400lbs. Our unguided rentals give you the freedom to explore shell island and cut loose! *Pricing should only be used as a guide as our prices can vary. Rent a Jet Ski, A Thrilling Way to Explore the Beach!